Welcome to issue #80 of the Bootleggers Buzz! Not much has happened this week, so we at the Buzz had to do our very best to create, yet another awesome issue for you to read on this fine Sunday morning. The main event of this week has been the shootings and struggles around Enemy of The State and The Phoenix Rebellion. When looking at the statistics page it becomes clear that Enemy of The State obtained a crew spot again, and The Phoenix Rebellion is lost from sight, is this really the last we will ever see from them now that Shitney_ has resigned? Only time will tell. I want to offer my sincere apologies to the Bootleggers community for not having this story covered this week. Some of our writers were involved in these events and weren’t able to cover them in an unbiased way. Due to unforeseen circumstances, the writer claiming this article wasn’t able to submit this in time so we will be publishing this next week. What else have we witnessed this week? The Jess Greenberg Foundation got wiped in the events revolving around The Phoenix Rebellion. We want to welcome Designated Drivers back to the statistics page, and newcomer this round: The Chicago Outfit. We have seen this crew on stats before but not this round so we don't quite know what to expect from them just yet. And at time of this writing, we see Padrinos Palace changing into La Onda, it seems Snaak doesn't want to throw in the towel just yet, but Padrinos Palace does? The Buzz will have this covered next week, as well. In this week's Buzz issue we’ve got columns, columns and columns, which isn’t a bad thing if you see these fine ones! ShyGuy wrote about the events revolving the death of R2D2. As most of you know there has been a discussion in game forum about the revival of R2D2 because his killer got banned and ShyGuy felt not all was said about this subject so he wrote a column about it. Also Rob_Stark wrote an amazing article this week about the Organized Crime feature and how this is used by the community, and Liliana6 wrote about the Bootlegging feature and how to revive this dying feature. It wouldn't be a real Buzz issue if we wouldn't have our weekly returning articles. Check out this week’s Something Old about the Staff Intervention Policy in 2009, or check out The Weekly Joke about some of the staff members. Forum Post of the Week is about the poker feature and the discussion around it. Or check out this week's freelance articles, all the way at the bottom! My work for now is done and I'm going to spend this fine Sunday elsewhere, enjoy reading this issue, and once again; my apologies for not having the main event covered, we'll make it up to you next week, I promise! What happens if you get killed and your killer gets permanently banned? If this happens, your account gets boosted. This week we witnessed a very interesting event, which resulted in a very interesting matter; an impossible boost? Yet another topic chosen this week by Dalton, can you keep a secret? It's about poker. This week I stumbled upon an article written by ShadowDragon at the beginning of round 6, about the Staff Intervention Policy. Original date of publication: Sunday, November 15th, 2009. 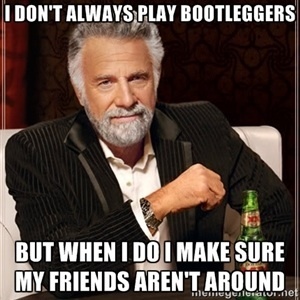 Each week we interview a random player of Bootleggers to find out what exactly is behind his or her name. The victim of this week’s issue: KeebzV2. Does anyone disagree with the current Organized Crime mentality? Here are a few flaws which have become common standard and, hopefully, in the future will be re-assessed! Bootlegging, even though it's the name of the game, how do we make it better? A whole lot has happend between Enemy of The State and The Phoenix Rebellion. Not a whole lot has happend this week, but this has! Unfortunately, due to unforeseen circumstances, we weren't able to cover this due to the absence of the writer who claimed this article. It would result in bad investigating on the Buzz's part to release an article about these events in this issue. Welcome back La Onda, bye Padrinos Palace? At the time of this writing I notice Padrinos Palace turning into La onda. This means La Onda doesn’t want to throw in the towel just yet, but it seems Padrinos Palace does. Have they sold their crewspot to Snaak, Because it sure isn’t a crew takeover? I don’t know, I’m just thinking out loud so don’t mind me. We don’t have time to find out so we will cover this event in next week’s issue! A column written by our beloved ex-editor ShyGuy, about recent events revolving around R2D2 and the ban of his killer. We also got a column written by Liliana6 about Bootlegger. We sometimes forget the game is named after a bunch of booze transporting mobsters! Rob_Stark wrote an amazing column about the Organized Crime feature and how this is used by the community! A crew which left statistics page recently has decided to give it another go and we now welcome them back as an official crew. In this week's Something Old, Something Gold, I found an article about Staff Intervention Policy. been losing all your Money? stats telling you your suppose to be rich? This week I've also created a funny meme for you guys!